This week let’s do another exercise in Juicy CLoud beamer use. Juicy cloud beamers are great power-ups, they work like magnets for clouds in the same color as the beamer. It gets better if at some point in the chain your beamer points at another beamer they will change the direction of the next beamer to vertical. But the best thing with beamers might be that in a chain with beamers with different colors the first beamer will change the color of the others to the same color as the first beamer in the chain. But most people don’t care how beamers work exactly since when you try to explain it, it sounds really complicated. 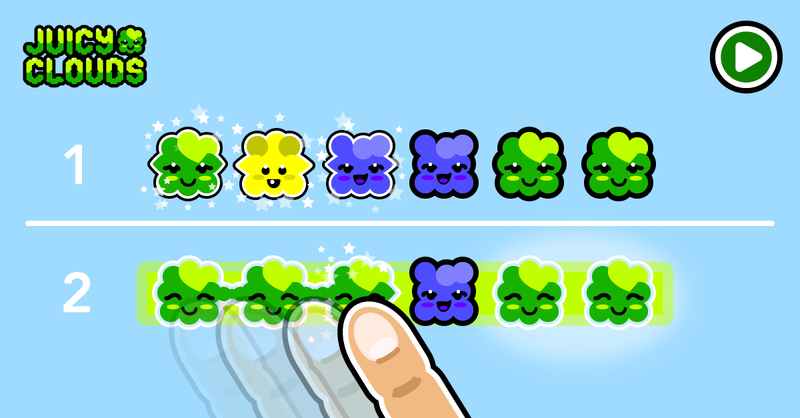 They just use those glitter clouds intuitively to win levels. Have a go at this one, as usual, it’s free to play and share with friends.